When I was a kid, I didn’t much care for dark, leafy greens. I viewed kale as a bitter garnish on a dinner plate when we went out to a nice restaurant. 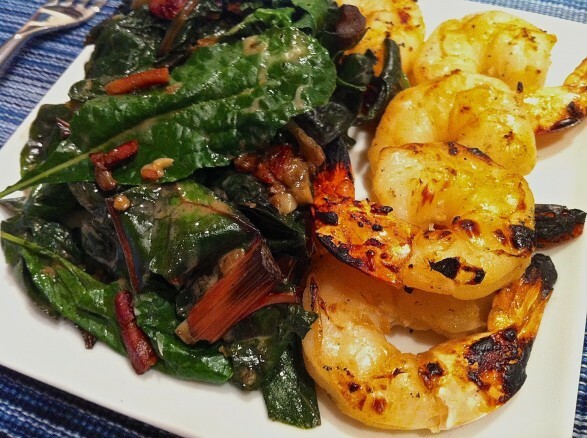 Swiss chard hadn’t quite entered the culinary scene and spinach…well…it was fine. As I grew older and heard repeatedly about the health benefits of these greens, I started cooking with them in new and different ways. Know what? They have become a favorite. Even my kids like them. Our chickens love them! We now grow them. I add greens to soups, pilafs, frittatas, make kale chips and so on. Perhaps my favorite way to eat these greens is simply sautéed. My go-to way of preparing greens is fast and easy and, along with any protein, is enough to make a hearty dinner. I never added cream because the greens taste so good without it. This summer, however, I had a creamed version of Swiss chard that was so incredibly delicious, I decided a little cream might need to enter the scene on occasion. This spin on that recipe mixes chard and kale and a small amount of half and half. If there is any leftover, it is the perfect base for a speedy omelet or frittata. I like to hold a couple handfuls of greens out to add at the last minute, after the final simmer with the half and half. This keeps the color bright and enhances the texture. 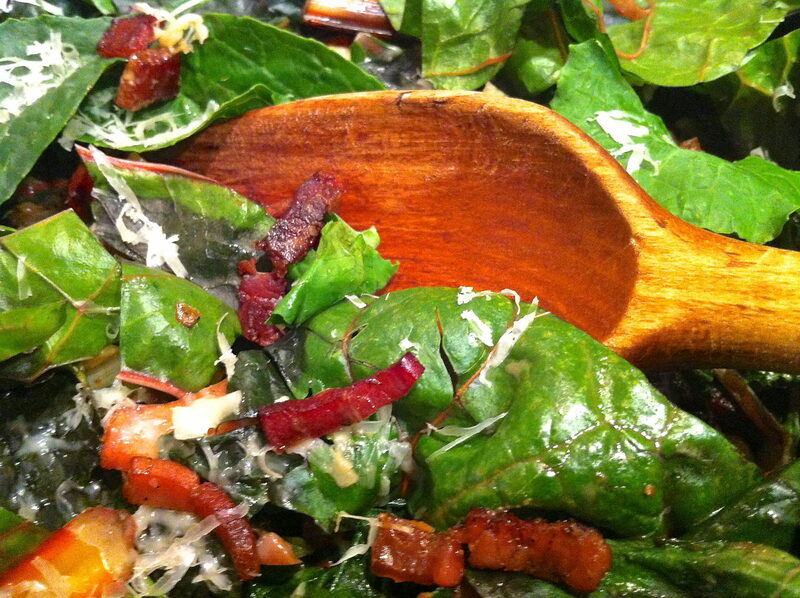 Spinach may also be substituted for one of the greens. Heat 1 tablespoon olive oil over medium-high heat in a large skillet or cast iron pan. Add prosciutto and sauté until beginning to cook, 1-2 minutes. Add onion and sauté until prosciutto is crisp and onion is golden, stirring several times, about 4 minutes more. Add chard stems and garlic and cook an additional 30 seconds. In batches, begin adding the chard and kale leaves, rotating them with a spatula as the leaves on the bottom begin to wilt. Continue to add more leave, carefully tossing so that all the leaves begin to wilt. Add half and half, nutmeg, and salt and pepper to taste, and simmer a few minutes more. Remove from heat and sprinkle freshly-grated cheese over the top. Yay! I now have another recipe for all this Kale and Swiss Chard growing in my garden. Thanks! We love this recipe! A tasty way to get kale into the family! We added your recipe to our Tasty Tuesday Welcome Fall post! THANK YOU! Looking forward to more! I am so glad you like this recipe, Kim, and appreciate your adding the recipe to your site! Thank YOU! Wonderful way to eat these veggies. The cream and nutmeg take them over the top. Thanks so much. I’m delighted you uncovered this recipe and enjoyed it as much as I do!